Zoysia grass is becoming a very popular lawn option in Tampa. Historically the most popular grass type in the bay area was St Augustine grass or maybe even bahia grass, but Zoysia is now seen as an emerging favorite. The fine textured leaf blade, the beautiful emerald green color, and the virtual immunity the grass has towards chinch bugs are just a few of the reasons that people love Zoysia grass. There are many different cultivars of Zoysia grass available, but the most popular one and most widely available one in the Tampa area is Empire. It is readily available, and the big box stores, local sod wholesalers, and retailers typically carry it. If you had asked most lawn care companies in the Tampa area 10 years ago about Zoysia grass most all of them would look at you with a blank stare. 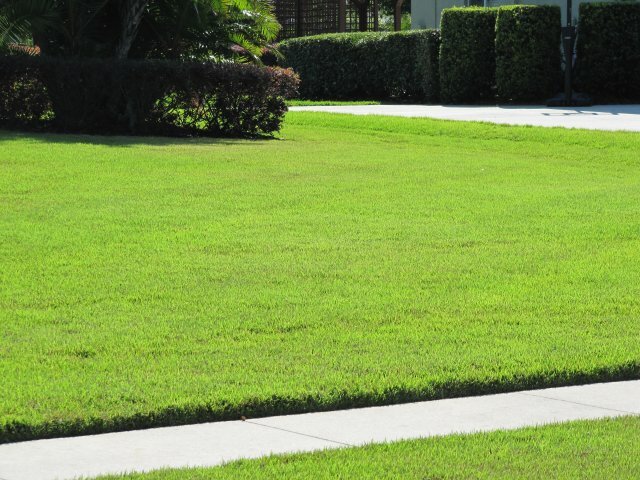 Zoysia is relatively new in the residential markets of Tampa. Many lawn spraying companies around do not have much experience with this emerging favorite, and treating it like it were St Augustine grass is just a mistake. Since no grass is perfect, it is really important to choose a lawn care company that has experience dealing with this new-comer to the lawns of Tampa. At Green Solutions, we started working with Zoysia grass in the Atlanta lawn care market in 1991. In fact, the 2 owners of Green Solutions actually went to college and earned Bachelor of Science degrees in Turfgrass Management (Auburn Univ. & Univ. of Georgia) in order to become formal experts in grass management. As you search around for service providers to care for your Zoysia grass, it is important to look for people with the proper experience and training in dealing with the various nuances of this new lawn grass. There are several misconceptions about Zoysia grass, and there is no shortage of bad information circulating from those that would sell it or service it. Often its drought tolerance is over stated. Many times people are told that it does not get weeds. Also, lawn companies that think you can and should fertilize it like St Augustine grass end up exacerbating disease issues in the Zoysia that otherwise might not have been a problem. Your best bet to protect your investment in Zoysia sod is to hire an expert. Call Green Solutions, your Tampa Bay Zoysia expert, for a free lawn analysis and estimate today.